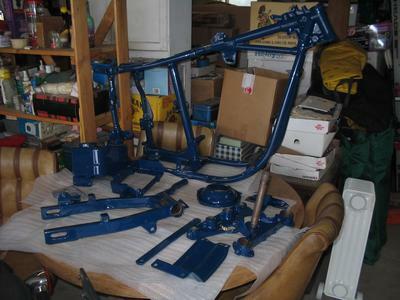 The picture above is the frame after powder coating postal blue. I Started with putting on new skins; then Taz and Hippie started in and now it's a complete rebuild. Been a year now, but it's coming together slowly but surely. There's a lot more to it than I ever thought, but for a 28 year-old bike, I wanna know her inside and out. i like to see people that are brave enough to paint there frames other than black that always looks good to me keep up the good work!